The EUROLIVE B315D active loudspeaker is exactly what you’ve come to expect from BEHRINGER – more power, more features and absolutely more affordable! Our engineers have really outdone themselves, creating a self-contained PA solution that merges state-of-the- art, 550-Watt Class-D power amp technology, an ultra-low noise Mic/Line input section with volume control, integrated DSP – and exceptional portability. Then we loaded the B315D with our best 15" long-excursion driver for incredibly deep bass, and a state-of-the-art 1.75'' titanium-diaphragm compression driver for exceptional high-frequency reproduction. The B315D professional active loudspeaker is destined to become a legend in its own right, alongside the other EUROLIVE models that have made BEHRINGER the world leader in active loudspeakers. We drew from our considerable experience to build the B315D performance grade loudspeaker and made it lighter (57.8 lbs/26.2 kg) and more powerful. With custom-engineered Class-D power amps for the ultimate in power and efficiency, backed by SMPS (Switch Mode Power Supply) technology – the high-tech alternative to heavy transformers and massive heat sinks – your B315D loudspeaker can run cool all day and all night without even breaking a sweat – or your back! With its 550 ultra-clean Watts of digital output delivered through separately powered drivers, courtesy of true bi-amping (2 amplifiers per speaker system), the B315D delivers high-resolution sound that really brings out the best in your music. While some of our competitors apply simple passive crossovers, which inaccurately separates the frequency spectrum and degrade driver performance, BEHRINGER has gone the extra mile – driving each woofer and tweeter with a separate amplifier for absolute signal integrity. Powerful, high-efficiency Class-D amplifiers and Switch Mode Power Supply technology coupled with state-of-the-art DSP functionality sure sounds impressive—but what about the part of the system you actually hear? Our LF (Low Frequency) and HF (High Frequency) transducers are designed specifically for each application – it’s what sets us apart from the competition. When you buy a BEHRINGER active loudspeaker, you can rest assured the transducers inside have been engineered to perform flawlessly with every other element for truly professional results. The B315D cranks out massive quantities of low end, with articulate, detailed mids and crystal-clear highs. 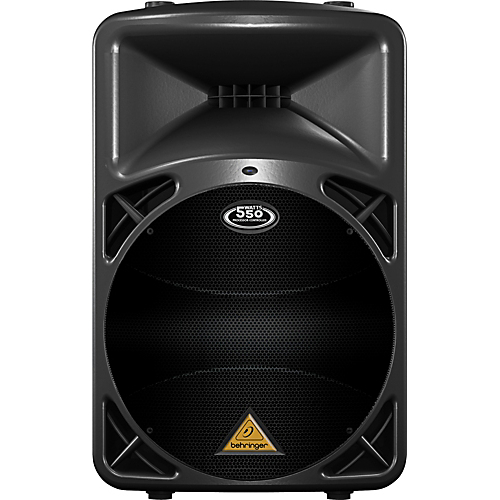 Thanks to its trapezoidal shape, the B315D is suitable for a wide variety of applications, such as mounting on standard speaker poles, vertical placement atop subwoofers, or even laid on the side for use as onstage monitor wedges. The B315D’s extraordinary fidelity and frequency response make it a favorite of vocalists and instrumentalists alike. Hookup is simple, requiring only a single XLR or ¼ " cable from your mixing console and power. Additional active monitors can be chained together via the XLR Link Output jack on the rear panel. Well, let’s start with your application… are you giving a speech in a hotel ballroom – or rocking out at the local bar or dance club? Whether to choose one speaker cabinet over another depends on your bass requirements. A 15" woofer has about 40% more surface area with which to move air than a 12" and that translates into more bass. So if you’re addressing a small meeting, or jamming at the coffee house, the B312D might be all you’ll ever need. But if you’re providing disco in a busy nightclub, hosting Karaoke night in your living room, or just need to crank it up louder, then the B315D may be a better choice. The BEHRINGER B315D active PA loudspeaker stands head and shoulders above the rest of the pack and delivers exceptional performance, even when pushed to the limit. Lightweight and powerful, with an integrated sound processor, 550-Watt bi-amplified Class-D power and custom-designed transducers, the B315D active loudspeaker is ideal for both speech and music applications – at a price that is unheard of in this class. Experience the B315D at your local dealer today and find out why more and more professionals are turning to BEHRINGER EUROLIVE Series active loudspeakers for their superb performance and extraordinary value.